Tourists on buses or river cruise tours are rushed along at such speed that stopping to take the perfect photograph much less enjoy the view at your own speed is impossible. On European Focus Private Tours, we go at your pace, not the other way around, leaving plenty of time to capture the scene to enjoy for years to come. We rode the fun funicular up to the old castle hill on the Buda side of Budapest. 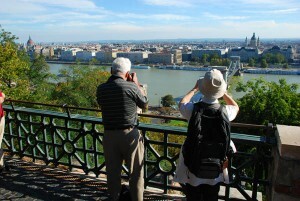 Once up there, we were treated to a splendid view over the Pest side with spires of Buda down below. The Danube really is blue, on a clear day. Posted in Hungary Tours and tagged buda, budapest, castle, danube, donau, europe, guided, hill, in, luxury, pace, pest, photos, private, river, slow, small, tours.